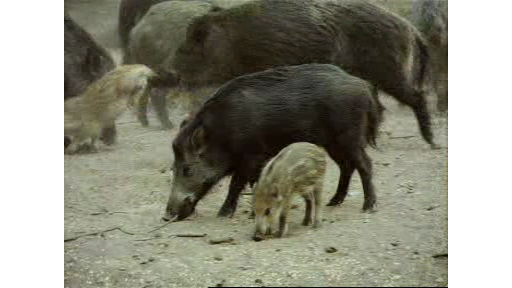 Large groups of wild boar and deer live in the nature reserve the Veluwe. The animals are getting additional food to give the tourists a chance to take a close look. Fences and cattle grids have been put up to protect the animals from the motor traffic. A special viaduct will also arise so the deer can cross the road safely. SHOTS: group of wild boar; tourists look at a group of deer at a feeding place from a lookout; cattle grid in the forest; traffic sign warning for crossing deer; scale model of the wildlife viaduct; group of deer in the forest.